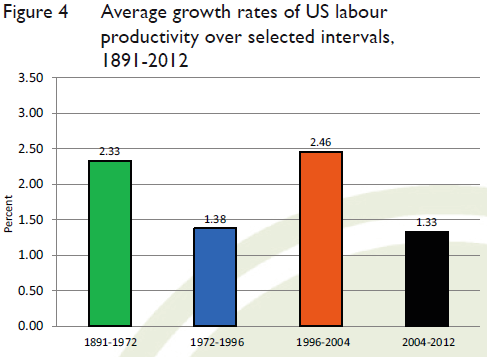 Can U.S. Economic Growth Be Speeded Up? It is widely recognized and deplored, see here and here, that economic growth in the U.S. has been very slow, averaging only 2% per year, since the end of the Great Recession in June 2009. The Federal Reserve has taken unprecedented steps to limit the severity of the recession by holding down both short term and long term interest rates. But these efforts are only partially working and are, unfortunately, having a number of negative effects as well. It also has been made quite clear that the problem is supply side and not demand side. This is because, on the one hand, wages are beginning to rise more quickly and consumers are spending more money but, on the other hand, business investment is shrinking which is leading to slow productivity growth. Conclusion. Yes, economic growth can be speeded up. But monetary policy won’t do the trick. Congress must intervene with the right changes to fiscal policy, i.e. lowering tax rates for both individuals and corporations, paid for by closing loopholes and shrinking deductions. 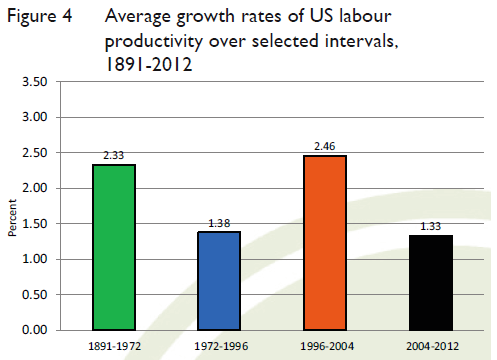 Economic Growth is Slowing Down: What Shall We Do about It? My last post, “Why Economic Growth is Slowing Down,” reports on the work of the economist Robert Gordon in his book “The Rise and Fall of American Growth.” Mr. Gordon makes a persuasive argument that the U.S. experienced an unusually strong economic growth spurt from 1870 – 1970 and that we simply cannot expect future GDP growth to replicate such a sustained streak in the future. Furthermore, in addition to much slower productivity growth at the present time, we are also facing strong headwinds to growth such as rising inequality, poor educational outcomes, demographic challenges, a huge debt burden and social deterioration at the bottom of the income distribution. Toward greater equality of outcomes. Increase the minimum wage (state by state in my opinion), expand the Earned Income Tax Credit to able bodied adults without dependents, reform sentencing to keep more non-violent law breakers out of prison (which makes them unemployable, and therefore poor marriage prospects, upon release). Towards greater equality of opportunity. Provide greater access to preschool education for all children growing up in low-income families. Allow college debt to be repaid as a percentage of taxable income after graduation. Reduce regressive regulatory measures such as occupational licensing. Reducing Demographic Headwinds. Focus immigration reform on raising the average skill level of the working age population. This would include both blue-collar skills and college degrees. I consider these types of reform to be relatively uncontroversial and therefore more easily doable through the political process. Other policy changes capable of speeding up growth such as broad-based tax reform (lowering tax rates paid for by shrinking deductions), major regulatory reform such as making the Affordable Care Act more flexible and the Dodd/Frank Act less restrictive, and approving the Trans Pacific Partnership to expand trade are all political hot potatoes and therefore will much harder to accomplish. The two main themes on this website, “It Does Not Add Up,” are that the U.S. national debt is too high and that our economy is growing too slowly. How can we shrink the debt (as a percentage of GDP) and how can we make the economy grow faster? I make use of all sources of information which shed light on these two fundamental issues. 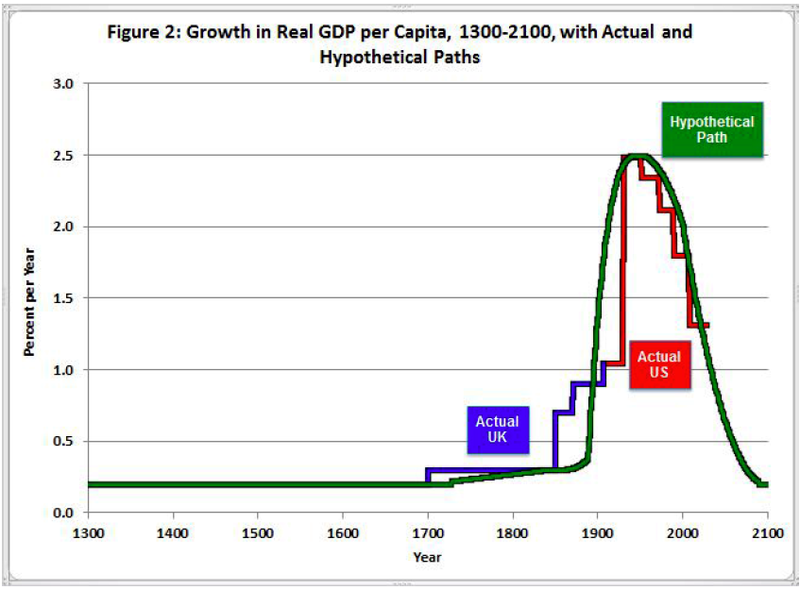 Today I briefly discuss the work of the Northwestern University Economist Robert Gordon, summarized in his new book, “The Rise and Fall of American Growth.” His basic thesis, see the above chart, is that human civilization experienced essentially no economic growth up until about 1700, then slow growth occurred mainly in the UK and US up until about 1870 followed by explosive growth mainly in the US up until about 1970. 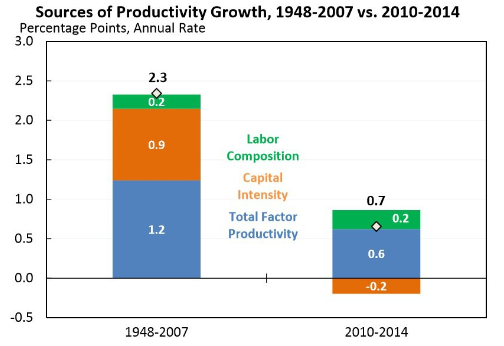 Since 1970 growth has slowed way down except for a brief spurt from 1994 – 2004. The First Headwind: Rising Inequality. Downward pressure on the wages of the bottom 90%. Increased inequality at the top. Educational outcomes strongly correlated with socio-economic status. The Second Headwind: Education. Stagnation in high school graduation rates and poor performance on international tests measuring achievement. High debt levels for college graduates. The Third Headwind: Demography. The labor participation rate has dropped form 66.0% in 2007 to 62.6% today, only half caused by baby boomer retirements. The Fourth Headwind: Repaying debt. The public debt, on which interest is paid, is now 74% of GDP and is predicted by the CBO to steadily increase. This will inevitably lead to either higher taxes or slower growth in future transfer payments. The Fifth Headwind: Social deterioration at the bottom of the income distribution. Increasing number of children are born out of wedlock for high school graduates and dropouts, much higher for blacks than for whites. For mothers aged 40, the percentage of children living with both biological parents declined from 94% in 1960 to 34% in 2010. Other Headwinds. Globalization and Global warming. Mr. Gordon makes a voluminous case for the slowing down of economic growth, the basic reasons why this is happening, and the social forces which are making it worse. Next: How should public policy respond to this huge challenge?